Smart devices, smart buildings, and smart cities: With IoT, the trend is clear that we will be analyzing and monitoring large parts of our personal and community life in the future. As a monitoring company, we follow this process with an alert eye and many projects dealing with the topic of IoT. 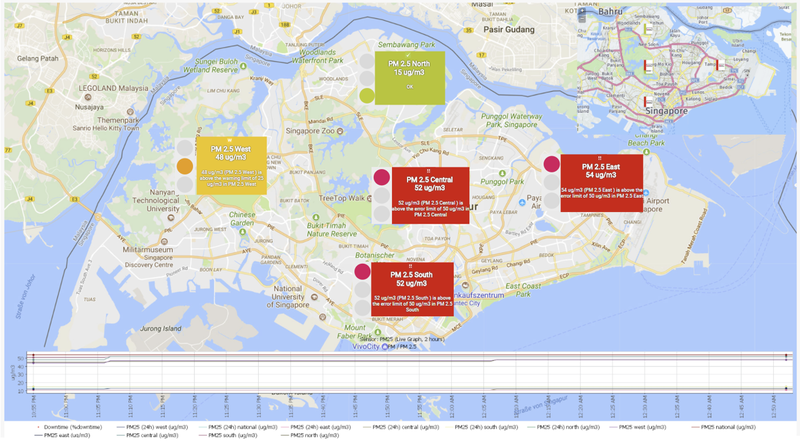 As we wrote in an earlier blog article, Smart Cities are the urban, technical path of the future and today we would like to show you the urban sensor evaluation of a city like Singapore. Quiet, clean, green - that's what the city of the future looks like, not only in Europe but also in Asia, a continent that stands like no other for overcrowded cities, with little space and bad quality air. Even there, cars will soon autonomically reduce speed in front of danger spots, in the houses clocks and watches will use sensors to adjust the room temperatures to the everyday rhythm of the residents, and in the streets relaxed residents will be able to use an app to display the appropriate times of e-transport for the fastest, safest or most low-carbon way to work. All this sounds like utopia to you? It is. Until now. The "Smart City", in the overall picture, describes a vision developed by researchers and entrepreneurs all over the world, with individual projects, initiatives and alliances. Although Singapore is known to be a very clean, safe and well-organized city, many environmental data, including those measuring air pollution, have been moving into alarming dimensions in recent years. Some problems are individual, regional challenges: The so-called “Haze” e.g. is formed by clouds of smoke from the Indonesian island of Sumatra. There, small farmers and plantation owners have begun slash-and-burn clearing of forests and fields. It is a yearly recurring ritual that often coincides with the onset of the dry season in the region. But most of the difficulties are typical problems of a populous city and can easily be transferred to other locations around the world. 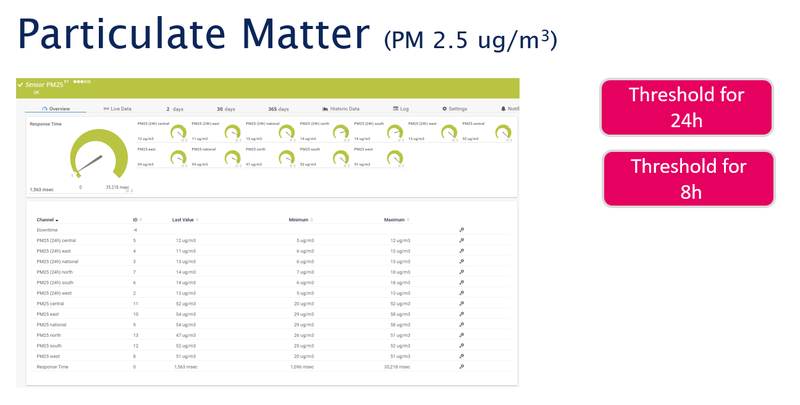 Fine dust particles, noise pollution, wind velocity, temperature, ozone, carbon monoxide, nitrogen dioxide, dioxide sulphur, road condition (humidity/temperature): All this can be collected, stored and analyzed and help to redirect traffic in an environmentally friendly way or to ensure greater safety at major events. The availability of public parking spaces can be monitored and controlled; traffic jams and accidents can be avoided by intelligent traffic control. In the long term, environmental data on air quality will provide politicians and municipal authorities with valuable data to successfully launch environmental campaigns. Figures like the Pollutant Standards Index (PSI), or the atmospheric aerosol particles, also known as Particulate Matter (PM) - controlled with different aerodynamic diameters - create comparability that is internationally accepted and at least partly in line with the WHO categories. All the important values and environmental data of a city like Singapore can be displayed and visualized in graphs and maps. 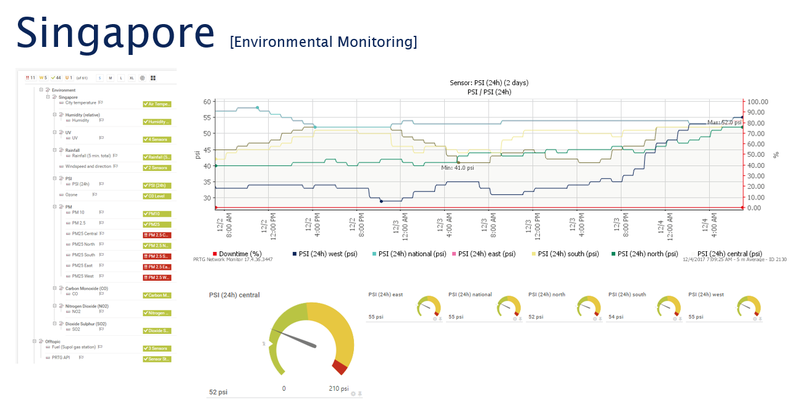 PRTG Network Monitor is an uncomplicated solution for all sensory data - display, sensor details, limit values and fault notifications can be customized to the highest degree. As the following screenshots show, we did all this using the example of the city of Singapore, down to the finest detail. For its recently launched Smart City Index, Roland Berger experts have pooled the most important building blocks of a Smart City strategy in the three main areas of application areas, strategic planning and IT infrastructure as well as a multitude of individual aspects. The six interdependent application fields of public administration – health, education, energy and environment, buildings and mobility – are of particular importance. According to these aspects, 87 major cities around the world were examined and analyzed to see how they are strategically positioned for the road to Smart City. The result: Vienna, Chicago and Singapore came out on top in the ranking - three cities on three different continents. Since ancient times it has been common practice to plan urban development instead of passively tolerating it. However, technological progress enables us to open up a completely new stage of development with Smart City. Never before has it been possible to obtain data, that is important for the further development of the urban population, so accurately, quickly and unequivocally. Significantly, however, it is not only the large technological companies that stand out on the global market and impress with their innovative solutions. Many small and medium-sized companies, including those from Germany, are involved in this process and come up with solutions to the unresolved questions of tomorrow's city. A lucrative business, as also statistics from Roland Berger show: By 2023, the volume of the global market for Smart City solutions is expected to be around 28 billion dollars. By 2017, it was $13 billion. As part of our PRTG Sensor Contest we have already presented the German startup SM!GHT: Developers at SM!GHT design street lamps that can do much more than just provide light. They fit perfectly into the challenge profile of a Smart City: integration of public WiFi, environmental sensors, electronic charging infrastructure, and much more. The journey has just begun.